Cabbies in Aberdeenshire may soon be allowed to pass on a controversial airport drop-off charge to passengers. Aberdeenshire Council’s licensing sub-committee will decide today whether or not to increase the booking fee for taxi fares from the region to Aberdeen International Airport to £2. This would match the terminal’s drop-off charge, which doubled from the £1, introduced at the start of 2015, to £2 for 15 minutes of waiting time earlier this year. The proposed changes follow a consultation into a review of taxi fare scales, carried out by the sub-committee. Councillors will also be asked to agree that there should be “no changes” to fare tariffs beyond the booking fee rise. But the charge could begin being added to journeys from Aberdeenshire to the airport on February 1. The council’s director of business services, Ritchie Johnston, said responses from the Aberdeenshire taxi trade had pinpointed the drop-off fee as the “main cause of contention”. 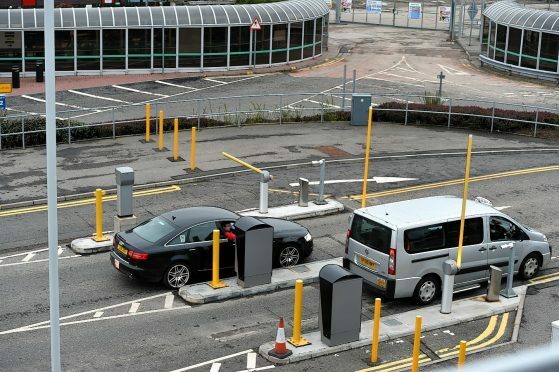 Last night an Aberdeen International Airport spokesman said: “Charges in our express drop-off zone are necessary, as it is a very restricted area, and we want to deter drivers from parking there, so we can provide the safest and most secure environment for our passengers and staff. In October, Aberdeen councillors backed plans to allow the city’s cabbies to automatically add the drop-off fee to the cost of journeys. However, at the city council’s licensing committee meeting, local members urged passengers to dodge the charge – by asking to be dropped off on the approach road to the airport. Last month, airport chiefs also introduced a new scale of penalties for those who overstayed their welcome in the drop-off zone, following a public backlash.